The election of Martin Schulz as President of the European Parliament is a reminder of the dominant role that domestic German politics now plays in Europe. It was part of a broader agreement that saw Luxembourg's Jean-Claude Juncker nominated last week as the next president of the European Commission. Make no mistake, Mr Schulz has not got the job he wanted. His first choice was to be president of the Commission himself, but that fell by the wayside when Socialist parties failed to win the most seats across Europe in May's election. His second choice was to become Germany's commissioner, with a powerful portfolio. But Angela Merkel vetoed that idea - she didn't want him representing her at the Commission. 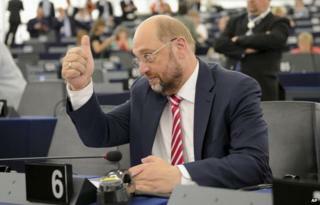 So this is the consolation prize - most Socialist parties agreed to support Mr Juncker at the Commission as long as the centre-right European People's Party agreed to support Mr Schulz getting his old job back in the parliament. Grubby back room deals? What grubby back room deals? And the genesis of this agreement can be traced back to coalition politics in Germany. It was the hostile reaction from her own Christian Democratic party (CDU), and her Social Democrat (SPD) partners, that forced Angela Merkel to backtrack and abandon David Cameron's effort to "Stop Juncker". (Pressure from influential parts of the German media played a role too). Mr Cameron seems to have underestimated Mrs Merkel's need to shore up her domestic flank. When push came to shove, she had to let the British prime minister down rather than complicate her own domestic affairs. Now the need for balance in the relationship between the CDU and SPD has helped produce jobs for two well-known Brussels insiders - Mr Juncker and Mr Schulz. Both men have spoken of the need for reform, but their victories are hardly a symbol of change. Meanwhile, Germany's two main parties seem to disagree on one thing: the importance of austerity measures and budget discipline to the health of the European economy. The Christian Democrats insist that strict rules must be obeyed. The Social Democrats want far more flexibility, closer to the position of centre-left governments in Italy and France. So Mrs Merkel's leadership in Europe will not go unchallenged. And it is worth keeping a close eye on the political debate in Germany.